A recent BBC news article reported on the development of a new, smaller type of armed drone that is able to aim and fire at targets in mid-flight, close to the ground. The drone is available for private sale, and the article notes the concern that such weapons technology could fall into the ‘wrong hands’ and be employed by terrorist organisations to target civilians. Indeed, it has been reported that Islamic State now uses low-cost drones in lethal ways by attaching explosives to them. It is right to ask what happens if these weapons fall into the ‘wrong hands’. But whose, then, are the ‘right hands’? The assumption here, of course, is that States will use drones in a more reasonable, limited and law-abiding way. But we must not lose sight of the dangers potentially posed by drones in the hands of States. Drones have, over the last decade, become a common means by which States carry out airstrikes around the world. They have been used by the UK, US, France, and others to target individuals in countries including Syria, Iraq, Pakistan, Yemen and Somalia. 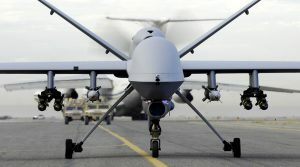 The Bureau of Investigative Journalism maintains records on US drone operations, and since 2008 its reports show that the US has carried out a minimum for 417 confirmed drone strikes in Pakistan alone, resulting in at least 2,359 confirmed deaths. More generally, in the US-led war against so-called Islamic State in Iraq and Syria, it was reported last month that since the beginning of the new Trump Administration in January this year, more than 2,200 civilians appear to have been killed by Coalition airstrikes (not limited to drones) – this represents a huge increase in civilian casualties (the minimum number of civilian deaths from airstrikes in the conflict under the Obama Administration is estimated at 2,300). In a recent academic article that three colleagues and I co-authored, we explore the different layers of rules under international law that regulate the use of armed drones and the ways in which armed drones have put pressure on these legal parameters. One of those layers is the law of armed conflict, which prohibits the direct targeting of civilians and the disproportionate loss of civilian life when targeting military objectives. The circumstances in which drones are used, however, means that identifying whether someone is a combatant or a civilian can be extremely difficult, and this is reflected in the disagreements between government and independent estimates of civilian casualties. In a report last year by the Bureau of Investigative Journalism, for example, the US’ claim that between 64 and 116 civilian deaths had resulted from strikes in Pakistan, Libya, Yemen and Somalia between 2009 and 2015 was said to be a ‘fraction’ of the Bureau’s estimates that put the figure at between 380 and 801. At the very least, greater governmental transparency is essential if any effective form of checks and balances is to be applied to deadly force by armed drones. Another layer of international law rules relates to when a State can use military force on another State’s territory, and these too have come under pressure from drones. In our article, we demonstrate how armed drones make overseas airstrikes much easier and safer from the point of view of the attacking State – there is no risk to your own force, unlike more traditional ground invasions or manned airstrikes. This allows wars with different actors (such as Islamic State) to spread. The possibility of wars becoming ‘global’, battlefields becoming undefined, and the exception of war becoming the norm of everyday life, is far greater with these weapons. We must not, therefore, lose sight of the grave threat that drones potentially pose to civilian populations. It is for this reason that we set out some key legal principles at the end of our article that we hope will be a starting point in discussions on how better to regulate these weapons. In addition, a resolution adopted last month by the International Bar Association’s Human Rights Institute, to which I contributed as a member of the Institute’s task force on drones, sets out in clear terms the core legal principles regulating armed drones. Initiatives like these are essential to protect populations from these kinds of risks that are posed by armed drones, regardless of whose hands they are in. Image: An MQ-9 Reaper drone on a runway, Staff Sgt. Brian Ferguso acquired from United States Air Force (Website), Licence: Public Domain.